Tonight, as I was driving home from work, I navigated around a truck stopped dead in the Lowry Hill tunnel. I thought about how reliable my car has been and for how long it has been that reliable. It’s twelve years old. I know it won’t run much longer. But I have so many memories of sitting behind that wheel that when it’s time for me to give it up, I will be ending a chapter in my life. It is not just a hunk of metal; it has quite literally been my vehicle for transformation. That car has moved me into all of my adult, single girl apartments. It’s taken me to weddings and funerals, job interviews and performances. It has saved me on winter streets, and it has sheltered me when I have needed to gather my thoughts and had nowhere else to turn. It’s taken me north, south and east across this country. Since the first time I slid in behind the wheel, it’s been my ticket to freedom. I have often taken it for granted, like this morning, when I stumbled out of my apartment, half asleep. I rested my coffee mug on its hood as I juggled my bags into the passenger’s seat. I turned the ignition and was on my way. I was so certain that it would start that it didn’t even occur to me to be grateful. However, tonight I am, and for the next couple of months, I will be even more grateful still. Each day saying a moment of thanks as I pull into my parking spot, remove my key and amble safely into my home. I’ve really been beating myself up the last couple of weeks. I’ve been frustrated with myself for not writing as much as I’d like to. I’ve been eating out instead of cooking, and I’ve been avoiding more scholarly readings for fashion magazines and gossip rags. There’s also been a bit of shopping for things I “need” (because my black boots are so last year). In general, I’ve resisted all of the principles that I thought I connected to on my yoga path. I know my weaknesses are not entirely to blame for this lack of willpower. Environmental factors have in no way helped these impulses. The start of the fall semester mingles with the end of summer. As the work load increases, the sun quickens its pace, and I lose those precious daylight hours that were spent out in nature and with simple pleasures in my heart. I am hurrying up to drink in the last lick of sun while simultaneously gathering the supplies I need for a dark winter of grading. And yet, somehow, with all of this frenetic energy, I feel as though the world around me has found a way to construct walls to hold me in place. It’s creating a sanctuary to shield me from that which moves too fast and from that which moves me in the wrong direction. In fact, when I try to move forward in any direction, I receive the gentle message to stay put and gather my strength. I have come up against an old limitation, and as far as my yoga practice is concerned, my asanas are at a literal stand-still. When I was 12, my school nurse found scoliosis curvatures in all three areas of my spine. When I was fourteen, my orthopedist wanted to fit me for a brace, but through chiropractics, that quickly changed. Through the years, I have discovered a blend of therapies that keeps my scoliosis in check and relatively pain free. Some weeks and months, I forget that it’s inside my body. Other times, the obstructions in the nerve and energy pathways are so great that my body feels as though its structure is being demolished from the inside out. When my scoliosis is at its worst, I get headaches that last for weeks and leave me in dark and silent places. I feel numbness in my shoulders and hands. I tend to drop the things I’m carrying and fumble with door knobs and keys. My natural gait includes a funny side step that lands me on my rear, and I trip up the stairs. It becomes painful to turn my head too far to the left, and my back muscles spasm if I sit for longer than five minutes. I have a massage therapist, a Rolfer and an acupuncturist, all of whom I go to at various intervals to clear up the discrepancy in my body that tells my spine to carry my rib cage over my left hip as my shoulders and head constantly fight for forward. But as I try to be patient, as I wait for the body work to catch up to muscle memory, I don’t want to give up on my yoga practice. 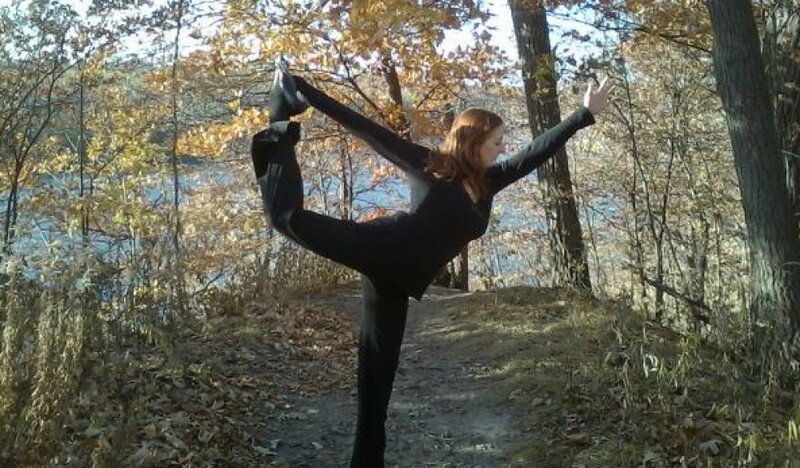 In fact, every body-worker I’ve seen since my diagnosis has commented on the benefits that yoga has on scoliosis. But while the benefits help to hold the treatments, they don’t completely prevent the flair ups. And I worry that the sensations of my curvatures will mar my ability to feel new injuries. So I cut the number of classes I attend. I modify the poses so that I don’t move as deeply, and I end my stretches before I feel the twinge of work in my taxed back muscles. I wish I could say that I meditate more when my scoliosis announces itself, but my motivation to get into that easy seated pose is about as strong as a whisper. Once I’m there, I’m fine, but the thought of sitting still for an hour, a half hour or even ten minutes, leads me to other distractions. When I finally sit down to retreat into the home space of my mind, the looming memory of past pains threatens to breach my bliss. When it comes to meditation, my fear of what I will find is the obstacle to deepening my practice. In the decades since that first diagnosis, a pattern has emerged for me. I’ve begun to see that my scoliosis is at its most powerful when a piece of my emotional identity emerges in a more profound and public way. After my semester abroad in Europe, the pain was so intense that a neurologist tested me for MS. When I was applying to graduate schools, I lay in bed as I typed and edited my manuscripts. The curvatures were pushed so far out of whack that it took months for me to move the endeavor back to my desk. So now that I am halfway through my yoga teacher training, now that I am beginning to conceive of the kind of yoga teacher I will be (not just the one I dream to be), my spine points out in all directions. Each of my three curvatures seems to be leading me toward a different path. Regardless of whether I choose to work more heavily with the alignment of the poses, the breath’s junction with movement or the meditation within the body’s stillness, my scoliosis is just waiting to hold me back. And in the last month, the curvatures have struck the familiar nerves of fear and self-doubt. I try to remind myself that this is just a pattern, like the pattern of heading to Smash Burger instead of heating the stove for a ginger-kale stir fry. I am, of course, more drawn to the comfort of fried potatoes. (Kale is not a comfort food.) But the excuse I repeat in my head is not one of comfort. It’s that I don’t have the time to cook. My deeper self knows that somewhere between driving, standing in line and waiting for my order, the length of time from start to table is a wash. The deeper truth is that I would rather avoid doing the work. I choose what I know will cause me pain rather than do what I know is right for me. I know if I cook the meal myself, the long-term hopes for my future are real possibilities. I hope to have resilient skin and strong muscles into my 80’s and 90’s. I hope not to add anymore cellulite to my thighs. Cellulite is the promise my beloved Smash Burger is ready to deliver on. It is the enemy of my hopes. But when I look at the cellulite, it looks like me. And when my back starts to ache, it feels like my back. I am a person with scoliosis. It justifies why I’ve ended up exactly where I am in life…no further. If I’m not careful, this condition can become more than a condition. It can take over; it can become an excuse. It says to me, “You see, THIS is why it’s taken you so long to become a yoga teacher. By trying to claim that authority, you risk everything.” And it could be right. I could risk my health, my financial independence and my lovely relationship to this practice I’ve languished in for almost two decades. So I stay safe. I pull back. I make one thing mean another. I retreat inside of myself. I am too afraid to look at the landscape of the place I’ve ended up. I am leery of the the changes I might see. I wait it out instead of taking a minute to acknowledge the very real possibility that I can trust myself. Of all of the people in my life, I wonder why, when it comes to my future, I trust myself the least. Especially since for the duration of my life, I have never had a problem deciphering the messages my body has sent me. I am confident that my body knows the difference between damage and growth. Damage has never followed my inspiration without an important moment of growth. I can trust that. I am on the right path, and my body’s signals only confirm that this change is a monumental one. In a training session two months ago, my teacher asked if anyone in class was afflicted by scoliosis. She wanted to show the class a live example. When I raised my hand, she looked surprised. And while after looking, she could locate the curvatures, she also commented on how subtle they were. As she did so, I felt a bit relieved that my journey into teaching yoga might not be as dangerous as I had once thought. I was also shocked by my possible strength. My teacher saw me as strong when she looked at me. It took my own story of my past to correct her. Our conversation was small, but it touched on something very powerful which is always in the back of my mind. I don’t think it’s an accident that three weeks later, my first curvature was re-engaged. I’m glad to have a reminder of the past. There are many important lessons here. But if I want to move any further with my practice, if I want to step into this calling, I need to test the lesson of trusting myself. And I’ve decided to look toward the change of the seasons to help me do this. For the next couple of months, I will be listening to the signals the earth gives me as momentary reminders to slow down and step inside. Each time I see a tree letting go of one of its leaves, I will be letting go of a piece of my own self-doubt. Each time I see a squirrel rushing over the dried grasses, I will gather a seed of conviction. Each time I feel a moment of fear, I will send it out for the wind to dismantle it, to break apart the limbs which are not working together and send its pieces back to me when the time is right. When my conscious identity is ready to be reborn.